One more level that the rockets are your most valuable ally in order to complete it. Create and clear large clusters of blocks especially in the middle of the screen. With this way you earn the required points and activate the rocket faster, without doing useless moves. 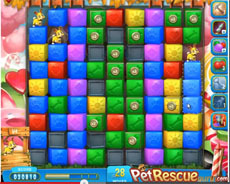 Watch this video for Pet Rescue Level 235! It will help you beat the level, without using any boosters!